A get together for Multiple Sclerosis patients proved so popular it is back for 2016. The latest edition of education and awareness initiative MS Talk’ will take place in Dubai on Saturday, 6th February. The forum was launched in 2015 by 28-year-old MS sufferer Maha Abbas, who was inspired after a visit to the MS Society in the UK. Maha was diagnosed with the auto-immune disease five years ago but struggled to find support and information in the UAE, where it is not known how many people have the unpredictable condition, which can leave sufferers tired and weak. 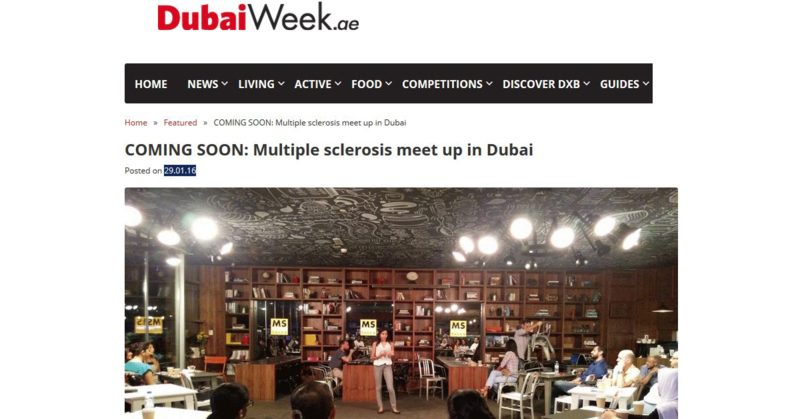 So the Bahraini national decided to launch MS Talks to spread knowledge, provide education and support MS patients, their carers and families. More than 50 people came to the launch event in October, to share their stores and find out more about the different types, symptoms and treatments of the disease, as well as meeting neurologists from the German Neuroscience Center. Maha explains what the get together achieved: ‘’We had such a positive response from the first event and so many people telling me this was exactly what they had been looking for that I came away already planning the next session. “There was a real sense of community between the patients which was wonderful to see and this time the focus is on offering a range of practical advice that answers their questions and aims to help them achieve the best possible quality of life. The German Neuroscience Center will also host a doctor’s corner where patients can seek professional advice one-on-one. Sounds good? The second event will take place The Pantry Café in Al Wasl Road, where the focus will be on nutrition and fitness. Speakers include dietician Hala Barghout from Nutri Talks and holistic nutritionist Kimi Sokhi, as well as personal trainers from Exhale Fitness Studio. Everyone is welcome to come along between 5pm-8pm and, even better, it’s totally free. Email interestedmstalks@gmail.com to register. • Globally, MS is the most widespread disabling neurological condition amongst young adults. • Most are diagnosed between 20 and 40 and women are twice as likely to be affected as men. • There are different types of MS and researchers still don’t fully understand the causes or progression. • The disease varies greatly amongst sufferers and symptoms can include fatigue, reduced activity, vision problems, numbness, tingling, dizziness and muscle weakness.